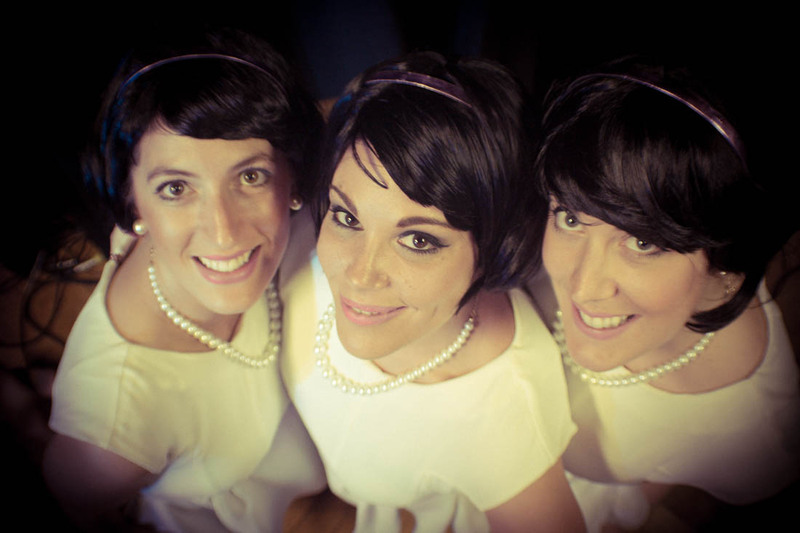 50s and 60s girl group for hire. Ladies and Gentlemen meet The Rockettes: An all singing all dancing musical explosion of retro joy!!! 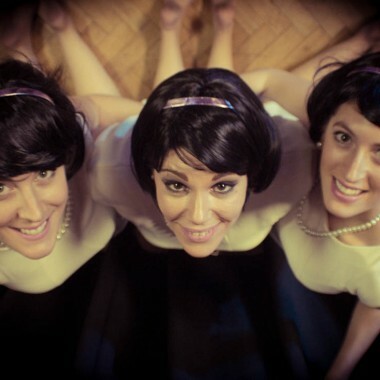 A Girl Group backed by an all girl band, The Rockettes play a set list of classics from the 1950’s and 60’s. 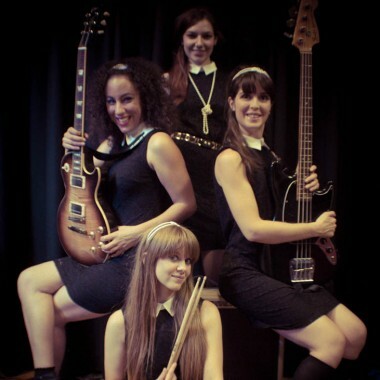 Comprised of some of the best female musicians in the UK, The Rockettes have toured worldwide working with the likes of Gary Barlow, Florence And The Machine, Taio Cruz, Cher Lloyd, Nicola Roberts, Andrew Lloyd Webber, Corrine Bailey Rae and Craig David. Now these girls have come together to create a new and unique sounding experience for your party. 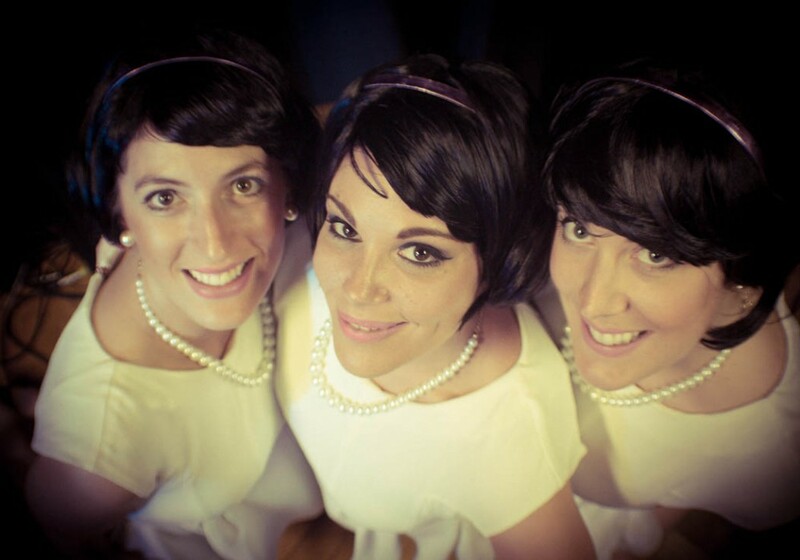 Book The Rockettes today and these glamorous girls are guaranteed to get your event rockin’! Emily – Vocals: Emily specialises in close harmony singing and vocal arrangement. She is a member of The Australian Pink Floyd show with which she has toured the world, playing huge stadium concerts as their backing vocalist. She also sings backing vocals for rock band Thunder. Alice – Vocals: Graduating from London’s prestigious Guild Hall where she studied Jazz, Alice is an accomplished musician and vocalist. She is an in demand singer having recently returned from a residency in Dubai. Sarah – Vocals: Setting up her own rehearsal and recording studio straight after graduating university, Sarah ran the company for several years before recently selling the business to concentrate on singing full time. Sarah – Drums: Sarah has played drums all over the world working with New Young Pony Club, Ebony Bones, GAGGLE, Nicola Roberts (Girls Aloud), Noise Ensemble. Live highlights include Bestival; Leeds + Reading Festivals; T4 On The Beach; Shepherds Bush Empire and Newcastle, Glasgow, Liverpool and London 02 Arenas. Kelly – Guitar: Kelly studied guitar at The Musicians Institute in Los Angeles and was lucky enough to be tutored by some legendary teachers including Scott Henderson. As a session musician she has worked with the likes of Taio Cruz, Nicola Roberts and Tricky. She also played in the House Band For Andrew Lloyd Webber’s television series Superstars, a live casting show on ITV. Danielle- Keyboards: Danielle is a professional keyboardist / pianist / vocals / songwriter based in London. She has been playing professionally since 2006 and has worked for various artists including Cher Lloyd, Tinchy Stryder, A*M*E and Cheryl Baker from “Bucks Fizz”. Danielle is currently working with Lucy Spraggan on her ‘Join The Club’ UK & Ireland headline tour 2013.